we love decorating our house for the fall season. recently, we had some indian corn and two pumpkins sitting on the table on our screen porch before we placed them around the house. ryan walked out on the screen porch and stopped in the doorway, motioning for me to come over. i looked out and found this cutie sitting on the table among the fall decorations. of course i had to take a picture. i guess he's all ready for fall! This photo would make a great October calendar photo! Leko was posing for you! Wow! Look at the two beautiful pumpkins. 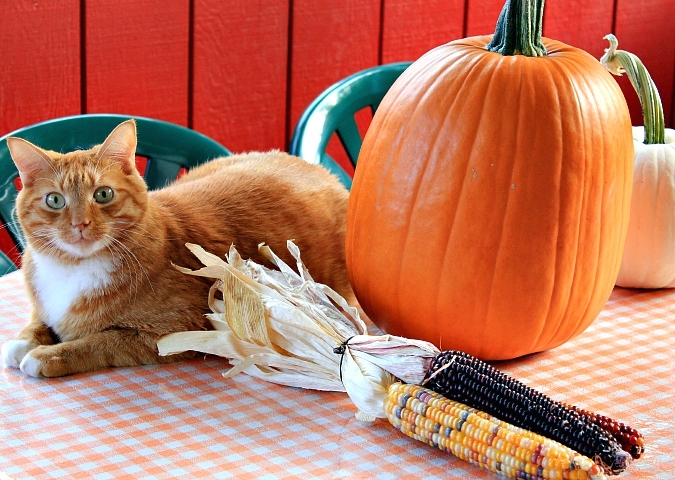 He matches the color or the pumpkin and his eyes match the color of the chairs.